The cruise ships will tender you into town. The port is located in the downtown area of the city of Angra dos Reis. Gaspar de Lemos, a navigator and commander of the Portuguese naval fleet landed at Ilha Grande on 6 January 1502, a “Kings’ day” – that is, “Dia de Reis”. 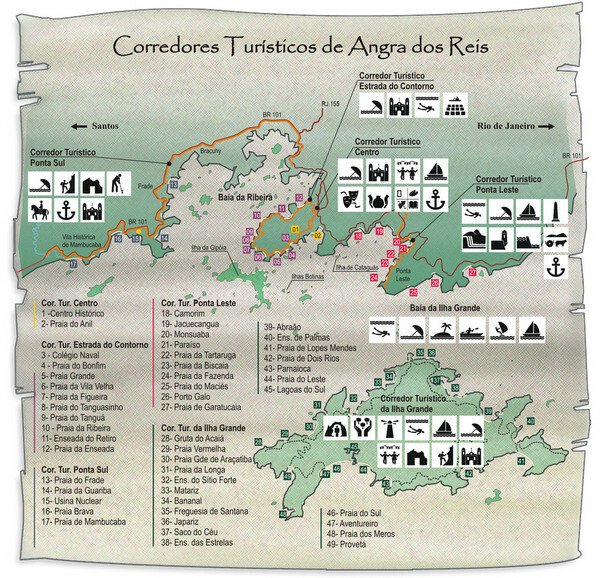 Accordingly, the place was named “Angra dos Reis”, which means “Creek of the Kings” or loosely – “Anchorage of the Kings”. Once a refuge for pirates and slaves, Ilha Grande is known today as an ecological sanctuary of lush vegetation and beaches with crystal-clear waters. A fascinating stroll will take you to Praia Preta, with its black beach, and the small Cachoeira da Poção. Agra dos Reis is a small port close but to the east of Rio de Janeiro lying on Ilha Grande Bay, an enormous bay full of islands. The port serves the agricultural hinterland, a sizable fishing industry, and the industrial city of Volta Redonda, 35 miles (56 km) inland. The town features beaches and swaying palms as well as colonial buildings including the 17th-century Church of Our Lady of Mount Carmel, the Igreza Matriz de Nossa Senhora da Coceicao, the convent of Sao Bernadino de Sena and the church of Nossa Senhora da Lapa da Boa Morte. Today, because of its beautiful beaches and nearby regions, the municipality has become a focal point for tourism - not only statewide but on a national scale also. Within the municipality are over three hundred islands, many of them owned by national and international celebrities, with the largest one called Ilha Grande (Portuguese: Big Island). Numerous boat and fishing trips to the nearby islands are being offered in the port. Angra’s Centro de Informações Turísticas 8am-7pm Mon-Fri & 9am-4pm Sat & Sun) between the bus station and the ferry docks provides information on Ilha Grande. Nearby Ilha Grande, the "Big Island", will be your best bet for finding art galleries, souvenir shops, and local handicrafts.